Goran Kosanovic for the Washington Post All kombucha has a little bit of alcohol in it. But lately, brewers are upping the ante, making kombucha with more than 5 percent alcohol in it — more than the average beer. MUST CREDIT: Photo by Goran Kosanovic for the Washington Post. Kombucha – as purveyors of the health elixir claim – has a multitude of health benefits: It can aid your digestion, colonize your gut with healthy bacteria and boost your immunity. And lately, it can get you drunk. All kombucha has a little bit of alcohol in it. But lately, brewers are upping the ante, making kombucha with more than 5 percent alcohol in it – more than the average beer. And many of them claim that the drink's health benefits remain intact. Get tipsy! For your health! Livin' the dream, right? That's not entirely how it works, some experts say, but it's certainly part of the drink's appeal – and why it's such a quickly growing category. “It's definitely a healthy beverage,” said Tarek Kanaan, who co-founded Unity Vibrations, an early producer of high-alcohol kombucha, with his wife, Rachel. “When I drink a gluten-containing beer, I feel a lot heavier and a bit more affected,” Rachel Kanaan said. Kombucha is a fermented tea that dates back to ancient times, with its roots in Asian culture. It is made by brewing tea and sugar, and leaving it to ferment with a SCOBY, an acronym that stands for symbiotic culture of bacteria and yeast. The fermentation also produces alcohol. The end result is a drink that's tart and sour, lightly carbonated and chock full of probiotics. With our culture's increased focus on gut health, kombucha has soared in popularity the past 10 years, commanding entire refrigerated sections of your local grocery store. In 2010, the Alcohol and Tobacco Tax and Trade Bureau cracked down on kombucha producers after tests of various brands revealed that the drinks contained anywhere from 0.5 percent alcohol by volume to 2.5 percent. Some stores were carding purchasers of kombucha, and Whole Foods pulled drinks from its shelves. Under federal law, kombucha with an ABV of 0.5 percent or more must be regulated as an alcoholic beverage. Commercial kombucha makers changed their formulas, and implemented additional testing to comply with the regulations. That's when the Kanaans decided to go a different route, and begin brewing their kombucha as an alcoholic beverage (they also make a non-alcoholic version). “It's old-style brewing, like Belgians or lambics,” Rachel Kanaan said. “In the second ferment, it's open-air fermented, too. It's allowed to brew, and then we bottle and we do bottle conditioning, which is much better than other companies that are force-(carbonating).” Their kombucha beer comes in several flavors: raspberry, ginger, bourbon peach and a KPA, or kombucha pale ale. Like other boozy kombuchas, it has emerged as a popular choice – and an alternative to cider – for those who avoid gluten. Other kombucha brewers charted a similar course. You'll see brands such as Boochcraft, Kombrewcha and Wild Tonic selling brews with from 3.2 percent to 8 percent ABV. That puts them at the level of a beer (typically a 4.5 percent ABV) and below a wine (typically 11.6 percent). Big beer companies are getting in on the game, too. This year, Full Sail Brewing Company launched Kyla, a line of hard kombucha – combining two trends, one of them is infused with cold brew coffee. And Boston Beer, which owns Samuel Adams, told the Post it has plans to introduce a new brand, Tura Hard Kombucha, in early 2019. The name comes from the word “natural,” and the brand will start with the flavors blueberry-ginger and hibiscus-wild berry. Distribution will begin in six states, including California and New York, before expanding. The drink will also contain shelf-stable probiotics, meaning it does not have to be refrigerated, unlike other drinks. Nutritionists aren't sure how much the probiotics in kombucha really help us to begin with. There have not been enough studies to say for sure, said Ginger Hultin, a registered dietitian, nutritionist and spokeswoman for the Academy of Nutrition and Dietetics. Boozy kombucha producers have to be careful about making health claims, though. 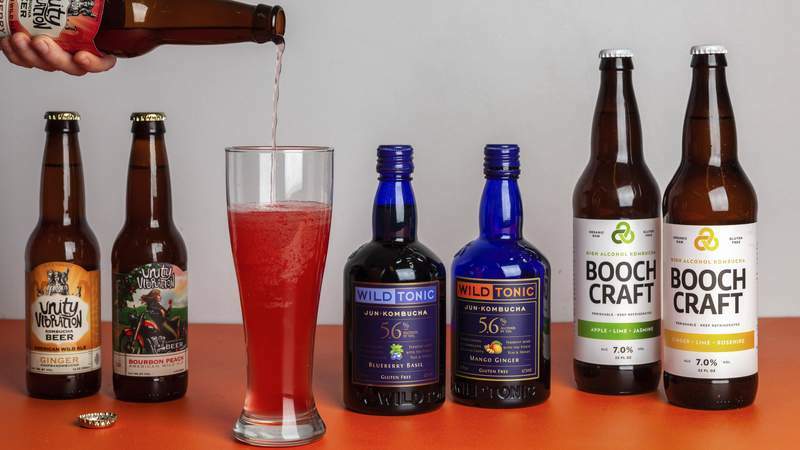 Because the FDA strictly regulates that language in alcohol, “You're not going to see health claims with an alcoholic kombucha like a regular kombucha,” Hultin said. Instead, it will be something vague: “Now you can enjoy the party and the day after,” says the Boochcraft label, seemingly implying that the drink may not give you a hangover.